Author: Aaron Reid & Mihalis Mathioudakis at Queen’s University Belfast. For 100 years, small, impulsive brightenings called Ellerman Bombs have been observed in the Solar photosphere , with sizes no more than hundreds of km across. With the advancement in modern optical telescopes, we are at a golden age to probe these small-scale phenomena and understand the mechanism behind their appearance. By observing Ellerman Bombs (EBs) with Hα imaging spectroscopy in combination with spectropolarimetry of a magnetically sensitive line with a similar photospheric formation height, we are able to identify EBs with regions of opposite polarity magnetic flux . This common, but not essential, trait of EBs has led to their appearance being explained via local flux cancellation, whereby the conversion of the stored magnetic energy into heat, leads to radiative emission which is observable in photospheric lines. In this nugget, we present evidence for this photospheric flux cancellation in EBs from images and inversions of the Stokes profiles of observed spectropolarimetric data, taken co-temporally with imaging spectroscopy of Hα to identify the EBs. All data presented here was taken with the CRISP instrument at the Swedish 1-m Solar Telescope (SST). An EB is shown at three different times in the wings of Hα, in the top panels of Figure 1. 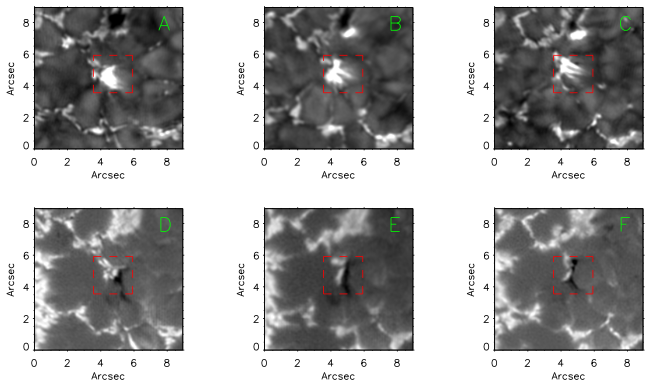 The lower panels of Figure 1 show the co-temporal Stokes-V images, taken in the blue wing of the Fe I 6302.5 Å line. 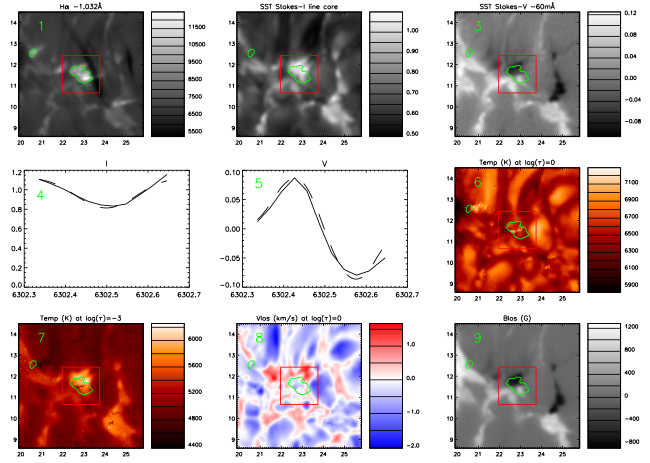 The Stokes-V images essentially show the line of sight magnetogram corresponding to the EB formation region, which clearly show a region of opposite polarity magnetic flux present. A region was selected around the EB and bipolar field (shown as a red box in Figure 1) to calculate the intensities in the Hα wings and the Stokes profiles. Figure 2 shows some of these intensities, where the sudden impulsive increase in Hα wing emission can be seen when the opposite polarities first meet, creating the EB. Figure 2: Lightcurves of the Hα wing intensity with the circular and linear polarisation of the EB . 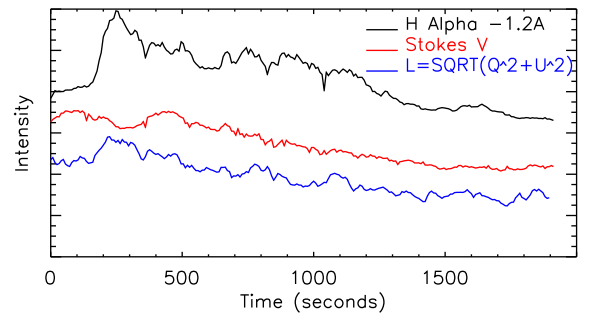 Figure 2 shows that the overall Stokes-V and the linear polarisation (L) of the Fe I 6302.5 Å observations decrease over time, along with the Hα signal. This decrease in the intensities of the circular and linear polarisation from the EB location indicates a reduction in line of sight and transverse magnetic fields respectively. This overall reduction in magnetic signal is then evidence for localised magnetic flux cancellation. Full spectropolarimetric data across a magnetically sensitive line can be inverted to determine the field strength, temperature and flows in the local plasma. Rather than just showing intensities of the line profile diminishing, it is now possible through inversions to get physical values for magnetic flux cancellation rate. The NICOLE inversion code  was used on an EB with co-temporal Fe I 6302.5 Å spectropolarimetric data. NICOLE solves radiative transfer for an initial guess model, calculating the Stokes parameters for the observed line, and compares them with the observations. By perturbing the guess model and recalculating the line profiles, the inversion code converges to an acceptable answer where the observations and the output from the model show a high correlation. Figure 3 shows the output of an example inversion with an EB. Due to the poor signal in the linear polarisation, only line of sight magnetic fields were considered for fitting of the line profiles. Figure 3: Inversion results of an EB (green contour). Panels 1-3: Observed images. Panels 4 & 5: Stokes-I and V profiles of observations (solid) and inversion output (dashed). Panels 6 – 9: Various output parameters from the inverted model. A temperature enhancement can be seen in the upper photosphere from the output models. The line of sight magnetic fields show strong opposite polarity flux at the EB location. Again, a region was selected around the EB, and the magnetic flux calculated between the start and end of the EB. This was done for 14 EBs, which found an average flux cancellation rate of (9.17 ± 1.26) x 1014 Mx s-1 . This compares to a flux cancellation value of (1.03 ± 0.25) x 1015 Mx s-1 obtained using the same method, but on co-aligned data from the Helioseismic & Magnetic Imager aboard the Solar Dynamics Observatory. With advances in modern optical technology it is now possible to probe even the smallest solar phenomena for information. We use magnetic inversions of high resolution spectropolarimetric data from CRISP to calculate flux cancellation rates and compare them to HMI. We find similar, albeit less noisy values for flux cancellation with the inverted CRISP data, but the CRISP observations are able to fully resolve the evolving bipolar structures. This allows for a greater understanding of the dynamics at play. In five of the EBs inverted, newly emerged moving magnetic flux regions entered the measurement box, skewing the results of flux cancellation. These new areas of magnetic flux often connected to the bipolar structures associated with the EBs. This fuelled the EBs further by giving the bipoles more stored magnetic energy to be released in flux cancellation. This was only seen in the inverted data, and not in the lower resolution HMI magnetograms.